Brisbane Velodromes Ltd poster for their sensational board track at Fortitude Valley. Board track racing in Australia first sprung into existence at Canterbury - Sydney during December 1928. Nine months later Brisbane Velodromes, Ltd opened Australia's second ever board track, popularly known as "The Drome" at Alexandra Park in Brisbane's Fortitude Valley. Now in 2014 a local architectural firm has won the contract to build Brisbane's second board track, this time round for the 2018 Commonwealth Games. For a second time running and after eighty five years, Brisbane bike racers and fans will have the chance to seek the thrill of board track racing. In the heyday of Brisbane's first board track, full time world class professionals from Europe and Australia were living in Brisbane, providing a spectacle of fast motor paced cycle racing and six day racing, setting many world records. Ask around Brisbane today about the original Brisbane board track, if your'e lucky you'll get an answer that it existed once, somewhere near the Exhibition showgrounds and that's where the trail runs cold. Today no one really knows anything about Brisbane's first board track. Don't despair I found out everything there is to know about Brisbane's Alexandra Park Velodrome, read on. Delving deep into Brisbane's archives, the story that unfolded of Brisbane's first board racing track, revealed an enterprise that went from boom to bust in just four summer track racing seasons, 1929 to 1933. Perhaps this short stint explains why Brisbane's enigmatic first wooden velodrome, has practically vanished from living memory. Management of the Brisbane Velodrome changed hands almost every year. Despite the financial shortcomings of the various velodrome managers, during it's brief existence, the Brisbane Velodrome was the place to be seen in town for sports fans seeking non stop, all action entertainment. 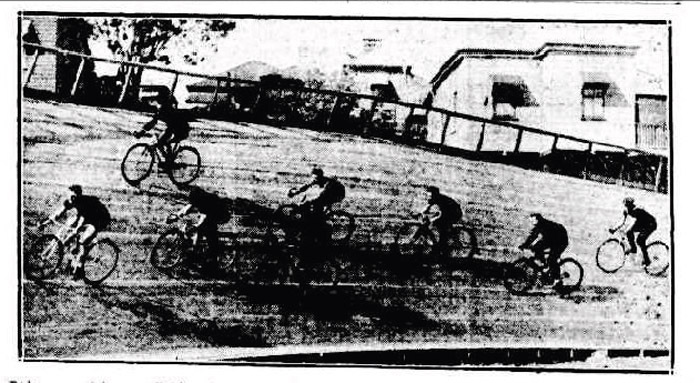 In the winter of 1933 when the money ran dry, the Brisbane City Council divided up the velodrome's timbers, then sent them off to bayside suburbs. The velodrome's wood used as sand catching groins, seaside seating and for a pavilion building along the waterfront. Alexandra Park recreation reserve was laid out on a selection of flat ground at Fortitude Valley, bordering on Bowen Hills. Brisbane's first board track was built and tucked into the thin wedged end of the park. The track stood between Exhibition and Alexandria Streets with it's entrance off Water Street. All now part of the RNA Showgrounds. Trams from North Quay in the city dropped patrons right to the door and punters from Ipswich could walk the five minutes from Brunswick Street station. You could book your tickets at Palings in the city and peruse the eight thousand seats on their plan to pick your favourite spot. When it rained at the outdoor track riders crashed on wet boards, events were halted and "Jupiter pluvius" was blamed as giver of rain and temporary disruptor of the biggest show in town. A wooden speed ring, it's Oregon pine boards roasted in the sun on hot summer days, at night making those boards the fastest in the world … Australian and European professionals wrote the records to prove it. On the hill behind Exhibition Street a row of timber clad cottages were perched on wooden stumps, looming high over the back straight of The Drome. You could have sat on the verandah's of the Exhibition Street cottages and watched the racing for free. At the time a visitor imagined Brisbane's cottages through Rudyard Kippling's words, "thin, tin, crackling roofs, …. To the cool of our deep verandah." From the cool deep verandah's of the Exhibition Street cottages you wouldn't have heard the thin tin crackling roofs, once the roar of the motors for motor paced events started up. Cyclists warming up in the back straight along Exhibition Street, at the opening night of the Brisbane board track velodrome at Alexandra Park, Fortitude Valley. Brisbane Velodromes, Ltd built the track for one purpose, entertainment. The main drawcard, international professional board track racing. Bicycle racing programmes were fought out through twenty plus events, some motor paced. Mixed into the programme were amateur events featuring the best of the locals. On some nights you could witness more than forty rounds of world class boxing, there was a purpose built "stadium ring" in the centre of the track. I found one of Arthur Dows' newspaper clippings from the era, describing a boxing tournament. "You could smell the sweat and liniment near the ringside. The area under the arc lights looked grey from the cigarette and cigar smoke." Other sports featured alongside the boxers and bike riders, there were running events. Motorcycle "speedway" races were conducted, this concept continued decades later where some cyclist's could win races on both motorcycles or bicycles on the same track on the same day. At the heart of this style of entertainment was the concept of multi-sports, I discussed this in the story on Australia's Vanishing Velodromes and here it is again. That was the way of the day, cramming into one programme as many varied events as possible for extreme entertainment value. So then at Alexandra Park Velodrome, you add in boxing midgets, wood chopping, weight lifting displays, the clowns named "Velo" and "Drome". Plus on other nights skating and night tennis, you had a true multi sports arena, right near the centre of town. The concept was right, the only problem was the lack of money. The thrill of motor pace racing at Alexandra Park velodrome, Fortitude Valley Brisbane. From the late 1890's motor pace racing was a popular form of cycle sport on Australian velodromes. Crowds attracted for the spectacle of speed, men behind motors at speeds of up to fifty miles an hour. The first "mighty motors" were raced at the Exhibition track in Melbourne. Ever since the Europeans headed by Thaddäus Robl thrilled crowds at the Exhibition Track in 1903, international motor pace racing was a favourite of cycling fans at Australian velodromes. Motor pace racing was the base concept, on which the Brisbane Velodrome was founded. Frank Corry was a motor pace specialist, he'd toured the world and raced with the best including six day race performances teamed up with legends like Reggie McNamara. Corry and his colleagues, managers of Velodromes, Ltd John Wren, H. C . Coggins, and W. Donohoe, knew the value of the boards, short tracks were fast and speed behind the motors would thrill eager Australian track racing fans. In 1926 Frank Corry himself planted the seed for American styled motor pace racing in Australia. "Sensational racing; with five or more motors on the track at once. This is the style of racing which Mr. D. J. Plunkett, acting on the advice of Frank Corry, intends to introduce on the Sydney Sports Ground." Up until then Australian tracks had long straights and were made of concrete, dirt or grass. Corry needed to capitalise on the new wave of enthusiasm for cycle sport so for 1928, he put forward a new plan for Australian velodromes. Give the punters a full programme of non stop entertainment, all contained in the close quarters of eight lap to the mile arenas, with speed at the core of the action. From Corry's dream, Velodromes, Ltd was born. Once the die had been cast, Corry was managing two velodromes, including the one in Brisbane while he was still training and racing in feature motor pace events himself! The plan for Velodromes, Ltd was to build a string of board tracks throughout Australia starting with the one at Canterbury in Sydney; Sydney Velodromes, Ltd. The next successful build was the board track in Brisbane; Brisbane Velodromes, Ltd.
On the 18th of October 1929 Sydney Velodromes, Ltd was registered as a company. REGISTRATIONS "Sydney Velodromes Ltd., capital £12,000 to promote and carry on motor and cycle racing, athletic carnivals, etc. First directors John Wren, H. C . Coggins, and W. Donohoe." Wren, Coggins and Donohoe had plans to build tracks in North Sydney, Newcastle, Parramatta, Goulburn, Perth, Adelaide, and in many other suburbs and rural towns. In January 1929 after the successful opening of the track at Canterbury the plan was expanded. Four more velodromes for New South Wales, so hard has the board track bee stung, that the management of Velodromes Ltd is arranging for the construction of four more tracks ..... sites have been selected at North Sydney, Parramatta, Goulburn, and Newcastle and it is expected that work will commence on the new dromes within a month ….. Frank Corry anticipated that the new venture is intended to run the string of tracks on the circuit system as practised with success in North America. Star riders will make appearances on the various dromes ..... and probably several riders will be sent to Newcastle permanently." The sporting spectacle at Alexandra Park Velodrome Brisbane. Building the two board tracks at Canterbury and Brisbane, was a great achievement for Velodromes, Ltd. The company just didn't get any others built, their plans a massive miscalculation. Apart from raising capital, one major stumbling block was the divide between amateurs and professionals. When Velodromes, Ltd put their proposal to the Amateur cycling club at Goulburn, the hometown of amateur racer Dunc Gray, the Velodromes, Ltd proposal was rejected. Goulburn already had a track and club members thought that involvement with Velodromes, Ltd meant, "An attempt to stampede the Goulburn Amateur Bicycle Club into professionalism." The same occurred at Parramatta, when the Parramatta amateur club resisted and determined the club would go it alone if and when they needed a velodrome in their district. This stony divide between professionals and amateurs in Australia remained up to the 1980's. Yet in the first half of the twentieth century professional riders racing behind motorcycles at speed, provided a spectacle of entertainment like no other and was the concept which Velodromes, Ltd hoped to capitalise on. Make no mistake about the calibre of pro riders, when they inhabited Canterbury velodrome, they'd been living in small cabins built at the track. Training and racing full time. When a rival company, Australian Sporting Co put a proposal to the N.S.W League of Wheelmen, to run races at the Sydney Sports Ground Velodrome, controversy ensued. Australian Sporting Co wanted to revive the old Sydney 1000 race, but Velodromes Ltd headed by H.C. Coggins had put in place a monopoly on racing in Sydney via an agreement with the League of Wheelman. The League of Wheelmen, their hands are, however, figuratively tied, and they are not in a position to give their sanction to the Australian Sporting Company. This is in view of the franchise they have granted to Velodromes Ltd., which, extending over five years, permits of no other promoter staging contests within 35 miles of Sydney. The new company's only chance, then, of carrying their project to fruition, would be to reach an agreement with Velodromes Ltd., but the possibilities of the Canterbury board track management falling into line with anything of the sort, are remote. Therefore, without the sanction of the controlling body, riders wishing to take part in the Sports Ground carnivals would be courting disqualification." It's no wonder there were problems with Parramatta and Goulburn when Velodromes Ltd were seen to be monopolising velodrome racing. Riders were even criticised for wishing to take part in the Australian Sporting Co events, in light of the "good work" Velodromes Ltd were undertaking. "Will the riders then jeopardise these prospects?" If that wasn't enough, Velodromes Ltd also made an under the table brown paper bag dealwith the N.S.W League of Wheelmen for the privilege. Now a number of concessions have been agreed to by the managing directors of Velodromes, Ltd. (Mr. Coggins), which aim at far-rending benefits. Not least of these are placing the controlling body (League of Wheelmen) in a sounder financial position and giving riders conditions which previously they have only dreamed of." One step further and Corry, Coggins and Co could have imagined themselves taking over the Australian cycling world with their "Dromes". Brisbane Board Track - Cool, Clean, Spectacular. The Velodrome's limited plan depended on European professional racers mixing it up with top Australian professionals, for the greatest entertainment value. In the first two seasons, the Europeans on the Velodromes, Ltd payroll were Maurice de Wolt (Belgium), Mat Engel (Germany), Willy Falck Hansen (Denmark), Brask Andersen (Denmark), Jean Bidot (France) and Oscar Rütt the son of famous German racer Walter Rütt. The problem was in the numbers, building a string of velodromes in many centres, required boundless resources in talent, i:e enough pro riders to race at all the venues. Then there was wages, and accommodation, let alone sourcing the land, building the tracks and their infrastructure alongside liaising with local councils and lands departments. Apart from lack of funding opportunities, the myriad of municipal contractual details contributed to the demise of the biggest ever plan for Australian cycling entertainment. What Frank Corry found was that they had their hands full just building and managing two venues, let alone taking on the role of entertaining an entire nation with a velodrome in every major centre. We had to wait for television for that. Enticing Australian professionals back to Australia to race alongside the Europeans was no easy task. World champion sprinter Bob (R.E) Spears reminded the press that top Australian riders like Cecil Walker, Reggie McNamara, Fatty (R.W) Lamb and Harris and George Horder were delaying returning to Australia because the scene was not as great as in America and Europe. "They would come willingly, said Spears, if sufficient inducement were offered." Fattly Lamb added some conviction to the need for Corry's American racing concept. Lamb gives some interesting particulars of the sport in America. He says that the Americans show great daring and aggressiveness in these races on the tiny specially built wooden tracks on which they are decided. These six days races especially a winter fixture in America; and the tracks are constructed in the great buildings such as Madison Square Garden, New York, or the Seventh Armoury In Chicago. The New York track is 11 laps to the mile, or 160 yards in circumference, and that of Chicago 10 laps. Riders to succeed as six day men they must possess all-round ability, the pure stayer may not have sufficient speed to respond in the sprints which start when teams attempt to gain or regain laps and there is no scope for the nervy rider. The race is just a whirl of excitement from beginning to end, with any team likely to gain or lose one or a dozen laps." Brisbane received their wooden racing bowl because the Queensland Amateur Cyclist's Union, the Brisbane branch of the League of Wheelman, the pro organisation and City Council all worked together with "Velodromes", as the company became known. At eight laps to the mile, the brisbane track was a long one compared to American standards. In April of 1929 Mr. E.J . Brown of Thos Brown and Company, Sydney, formed the company, Brisbane Velodromes, Ltd and sourced the finance to run the Brisbane track. Brisbane Velodromes, Ltd …… a site has been obtained at Alexandra Park, on which a board track will be laid out on a scientific basis. By this means the company hopes to revive interest in the thrilling and popular sport. The track will be set with a measurement of eight laps to the mile …. banking and curves have been calculated to ensure the utmost safety to riders and racing will be conducted under strict rules … Racing will take place on two nights of the week, Wednesdays and Saturdays." In the same month the Brisbane City Council approved the project and made sure they would retain ownership of the land and structures, in the advent of non payment of rent or end of tenure. "At the last meeting of the council a report recommending that a license should be granted for a velodrome in Alexandra Park was referred back to the health committee … expressly stated … when motor cycles should be used for pace making the machines will be effectively silenced. The committee recommended that upon execution of the lease, with consent of the Lands Department and the erection of the structures to the satisfaction of the council, a license should be granted for the following amusements: Cycling, including motor pacing, foot running, wood chopping, tennis and skating. The chairman of the Parks Committee said that the fixtures became the property of the council at the end of the term for which the company had the use of the land." The entire Brisbane Velodrome structure was built in a short time frame between mid July 1929 and when it opened on the fifteenth of September. Notably and you'll see why later, local bike racer and timber merchant Fred Thurecht supplied the Oregon pine boards for the track and other timber for the 8,000 grandstand seats. A week before the opening while the plumbing fixtures and lighting were still being installed, the management let the pro's and the amateur clubs have a free for all session on the track. The venue was swamped with enthusiastic riders keen to try out the boards. The steep banking scared the wits out of some of the local amateurs, only the best were chosen to compete in their own amateur race programmes. On the fifteenth of September 1929 the track opened, it was an immediate hit. OPENING OF THE VELODROME Seating for more than 5,000 in the stands behind the two straights, with capacity for 3,000 more being erected. The lighting of the track has been installed. Opening night saw 21 events in two and three quarter hours. There will be a new event every few minutes and no time will be wasted .. it will provide practically a continuous entertainment. A fine eight-lap board track the first to be built in Queensland… spectators were thrilled by the perilous angles and motor pacers speed, the track was brilliantly illuminated and a musical system provided the house of about 3,500 with an additional diversion. The thrill of the evening was when a mist of rain came over the track causing a rider to smack the rail at the top of the track and come sliding down again." By December of 1929 the bike races had sports fans flocking to Alexandra Park, they were hooked on a new bike racing craze. 45 MPH ON SAUCER TRACK THE LURE OF THE VELODROME. Brisbane is increasingly devoting it's attention to cycle-racing and the advent of the saucer shaped board track has been wholly responsible for this wave of public enthusiasm. "Wave" however is hardly a correct term because it suggests a peak and a decline. From present indications it would appear that there will be no decline in interest; board track racing is here to stay. Every Saturday evening since the opening of the season the Velodrome ampitheatre has been packed with spectators who have been gripped by the fascination of speed, of skill of daring." The honeymoon period over in just a few short months. Professionals had smashed world records in the 1929 - 1930 summer season, then departed for Europe. Danish rider Falck Hansen who'd lived in Brisbane for the season expressed his gratitude. "On the eve of my departure from Queensland I desire to express my very keen appreciation of the kindness and courtesy which have been extended to my wife and myself during our stay in Brisbane… I am looking forward to riding again at the Brisbane Velodrome." Hansen would never return. By the time the velodrome was due to open for it's second season in October 1930, Brisbane Velodromes, Ltd had a new board of directors. Whether Brisbane Velodrome will re-open this season is causing no end of speculation. The velodrome is the only real cycling track Queensland has ever possessed, but it's operations last season were handicapped by lack of capital. Debentures have been raised to start the new season. New directors in Messrs Hall, Bates, Heap, Doughty, Bell, Thurecht the timber merchant who supplied the timber for the structure and Johnston have been appointed….. If the board track is again opened, prize money must be reduced, as must admission charges and general overhead expenses." The 1930 - 1931 summer season got off to a slow start in mid December 1930, Jean Bidot, the french star was contracted along with top Aussie pro's. It was a roller coaster ride from there. No sooner did the season kick off, it was shut down again for Christmas while the bike riders went to race at the Gilgai Christmas carnival and spectators ducked off to the coast for holidays. The pedal game is in a parlous state in Australia. Cycling in the doldrums in Brisbane now. Poorly attended meetings make future doubtful. Is velodrome doomed. No sport can flourish without liberal public support and for that reason the immediate future of spectacular board track racing in Brisbane Velodrome is clouded in doubt. Despite the dazzling racing served up by Velo riders, attendances haven't been payable … concern started with insufficient capital, while requirements of riders and public have not been given the attention merited. Consequently what should have been a veritable boom has developed into a complete washout. Where the directors were entirely too extravagant in the opening season, they have gone to the other extreme this summer. The riders who were the main attractions have not been paid enough to meet their rent bills, in fact several competed in races for nothing….. Amateurs have been practically neglected … Weekly losses this season forced the directors, who have not bottomless pockets to cut out prize money and ask the riders to compete for a percentage of profits, but the first meeting of the New Year, because of shortage of cash after the holidays was a failure. The riders got nothing. For the southern visitors, professionals, are dependant on the sport for their livelihood, and have to retain trainers etc. Without them the game would be in a sorry plight." Six Day Race at Brisbane Velodrome 1932, with Hubert Opperman on the bill, plus Fatty Lamb and Ozzie Nicholson and many others. In February 1931 the trouble was amplified, management couldn't afford to pay the pro riders so they didn't race, the amateurs were the only riders on the bill. At the end of June 1931 at least one thrilling race took place, some money had been found to pay the pro's once more. French star Jean Bidot beat Aussie rider Jimmy Beath in a three match motor paced sprint, Bidot leapt off his bike and kissed his pacer, Les Vowels. The same week that Bidot was kissing his pacer, Brisbane City Council had taken possession of the track, the Velodrome company unable to comply with council regulations. After a disastrous second season, the tenacious timber merchant Fred Thurecht had taken Frank Corry's place and was appointed as "Chief Promoter". A group of debenture holders in the Brisbane Velodromes, Ltd company had made proposals to take over the track as well as the Amateur cycling body. "Disastrous cycling season last summer ended in council taking control for no payment of rent and rates. Up to date the board track has been a complete financial flop…. efforts of the amateur cycling body (QACU) to secure control, .. not nearly enough good riders to begin with." Ownership had transferred from Brisbane Velodromes, Ltd, to the Brisbane Council, then in September 1931 the Queensland Amateur Cyclist's Union took over management …. "For amateur meetings, even if a fortune is not made out of it, the meetings will help foster the sport." The very premise on which the Velodrome had been built as Frank Corry's dream, to provide pro entertainment to the masses, had been superseded in less than two years, with the amateur cycling body tentatively taking control of a venue that was not intended for their purposes. From that moment on the full effect of multi-sport events become the focus at the track. Local amateurs, legends like Tom Wallace now came to the forefront. In February 1932 mixed sports events attracted the crowds, "A mixed programme, the chief event will be a under-hand woodchop with 25 of Queensland's best axemen, a cycling programme featuring Tommy Wallace, two six round boxing matches and a 75 yards first-class open handicap foot race. Teddy Cloak, the child speed king will appear in his miniature sidecar outfit. Velo and Drome, two popular clowns will provide amusement." Six day race under way at Brisbane's Alexandra Park Velodrome. The outdoor track a far cry from the roof covered, 55 million dollar Commonwealth Games velodrome, planned for Chandler and the 2018 Commonwealth games. You'd think by this stage the game would have been up for board track racing game in Brisbane, but the amateur cycling body had two aces left up their sleeve. The Australian Championships were held on Alexandra Park Velodrome in January 1932. The second Ace, Australian cycling legend Hubert Opperman. In August 1932 came the "Great Ressurrection". Opperman was attracted to Brisbane for a six day race with a £1000 purse. By then most Aussie cycling legends of the era had raced in Brisbane including Grant Pye, Dunc Gray (Goulburn) with locals Tom Wallace, Shefer Goubareff and Jack King. Plus Cecil Walker, George Dempsey, Jack Dempsey, Mick Fitzgerald, Bob Broadbent, H. K. Smith, Jack Fitzgerald (Australian sprint champion) and Fatty Lamb (Victoria). Once Opperman was confirmed for the 1932 Six Day race which coincided with the RNA show, the superlatives were let loose in the local press. Oppy Comes At Last, Attracted By £1000 Six Day Race … Queensland's Greatest Cycling Carnival Brisbane will be the scene of the greatest cycling carnival ever staged in Australia. This phenomenal cyclist - this "oppy" who is known throughout the entire world … There was only one Phar Lap : There is only one "Oppy". Ever since Hubert Opperman flashed across the cycling firmament Brisbane's enthusiasts have been awaiting an opportunity of seeing him. At last he has come right at the pinnacle of his fame. The £1000 Six-day Race is the magnet which has attracted him …….. Australia the baby of the nations - still in her swaddling clothes …….. AMAZING STAMINA Opperman's powers of endurance have amazed the medical profession .. confess themselves what this paragon of energy can accomplish, without showing any effects, even tiredness. In the six day race he will be seen as a dour "grinder", battling for laps." In the end Fatty Lamb and his partner Jack Standen won the 1,485 mile six day race of 1932. That was it, the flash in the pan, the final curtain call for Brisbane's wooden speed bowl, it was finished. Racing and organisation limped through the final season, tailing off toward the end of the 1932 -1933 summer. Brisbane six day race August 1932, Alexandra Park velodrome. Ossie Nicholson, eventual winner leads the field, followed by Arch McClennan, Gilroy, Jack Fitzgerald, E. Gibaud, Jack Standen and Fred Wakefield. At a meeting of the QACU in February 1933, it was decided that a better option for racing, instead of this beautiful oregon pine track, would be the long dusty straights of a dirt oval around Lang Park. The main reason, lack of money, the Great Depression had hit hard and Lang Park was the best alternative. A representative from Hamilton Wheelers reckoned the Brisbane Velodrome was dangerous. Some members at the QACU meeting said that, "the bottom had fallen out of board track cycling", one member suggested that a dirt track should be obtained instead. It was stated that cyclists would not ride at the Brisbane Velodrome because of the expense entailed. "It was driving junior riders out of the game." The QACU could not afford the £5 per week rental fees. Tyres were also a concern for racing at the velodrome, costing too much "owing to tyre troubles". Six Day race Brisbane Velodrome poster. In May 1933 the Brisbane City Council announced that they would demolish the Velodrome, "Alexandra Park will be enlarged by the addition of the area occupied by the velodrome ….. when the demolition of the velodrome has been completed … the timber from the structure will be used by municipal departments." Over the winter demolition took place and by September, just four years after the first race on the track, the final announcement from council. A good deal of the timber had been sent to Wynnum and Sandgate, where it had been required for groins to gather the sand, and for additional seating accommodation. At Sandgate the wood was also being used for the construction of a public gallery at the baths. The timber was in a fair state of preservation." While the hum of the boards, the thundering motors, smell of liniment and sweat had faded from Alexandra Park, the story lived on in a tenuous thread through the memories of those who'd lived to witness Frank Corry's dream. In 2018 when Brisbane's second board track opens, this time there will be a roof overhead and the bike riders who race there, will know nothing of the first board track. Some of the same amateur clubs will be there, as they were at Alexandra Park. Brisbane will once again be able to host the national championships, the last time being March 1995, on the concrete velodrome that was constructed at Chandler, for the 1982 Commonwealth Games. The new 55 million dollar track will be built on the site of the car park adjacent to the concrete velodrome. Once the new indoor velodrome is complete, the old 1982 Commonwealth Games track at Chandler will be demolished. From Toowong, to the Cricket Ground at Woolloongabba, to Alexandra Park then Lang Park, Hawthorne Park and finally Chandler Velodrome. Brisbane has hosted national championships on all of these tracks, and international race meets. The cycle continues with Chandler Velodrome Mach 2. Brisbane International Board Track Events included six day racing and Australian championships.